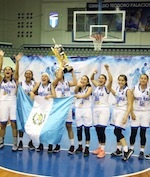 Guatemala celebrated Central American U16 Championship title as they won all four games at the home tournament. In the last game Guatemala U16 overcame Honduras U16 90-22. Natalie Larranaga (165-F-02) top-scored for the winners with 39 points, while Elisa Martinez (00) poured in 27. Andrea Pinto (SG) and Mariana Escobar followed them with 6 points apiece. Angelly Morales netted 12 points in the losing effort. 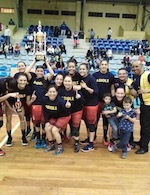 Asiole win Liga Mayor Metropolitana Clausura 2018 title beating Nolitas 2-0 in the Final series. In game 1 Asiole posted a 49-46 win. VANESSA VASQUEZ led her team to another 63-59 win in game 2 to lift the trophy. She collected 32 points and 13 rebounds, while ALMA SOFIA LOPEZ had 15. EMILY ROSALES QUAN replied with 24 points in a loss, whilst LUISA RIVAS netted 17.